I've known the word "azo" for years, because of its potential as a high point-producer in Scrabble, but did not know what it refers to until today. 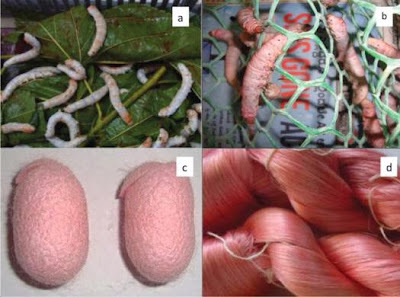 That is the type of dye that Indian researchers have succeeded in getting silkworms (Bombyx mori) to eat so that the thread they produce for their cocoons comes out in color. So far it has only worked with red dye which produces pink silk, but this green method has the potential to save enormous amounts of water. Although water will still be required to boil the cocoons to harvest the silk, it will not be contaminated with dangerous chemicals, which require expensive treatment before it can be released back into waterways – and will avoid the environmental damage caused when the water is not cleaned up. Although some animal rights activists still object to the killing of the silkworms in the process of making the fabric, in many countries – including India, China, Korea, Japan, and Vietnam – the boiled worms are eaten as food. No word yet on whether pink pupae are safe and will become a delicacy.